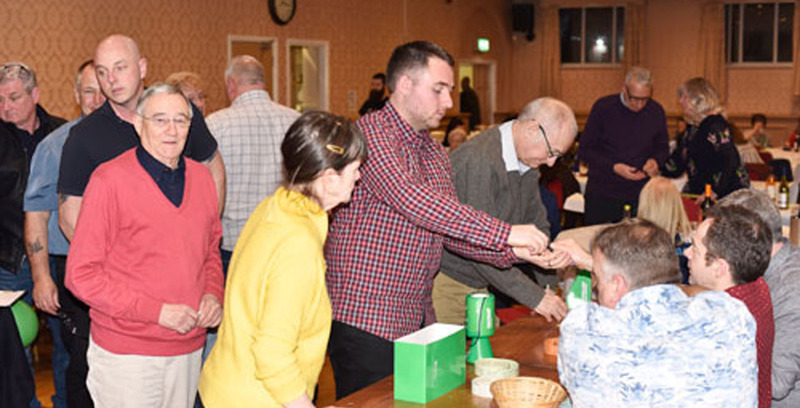 The members of the Leigh Group Social Committee presented a race night for the enjoyment of the members of the Leigh Group and their guests with proceeds benefitting the Leigh Group Masonic Hall Committee and the Macmillan Cancer Support charity. Pictured from left to right, are: compare Andy Savage with Leigh Group Social Committee John Galbraith, Paul Hook, Simon Isherwood, David Pickles and Wayne Barnes. The evening was priced to attract at only £10 for the entire evening with a hotpot supper and apple pie with ice cream for those that needed a little something extra. There was no need for desert really as the hotpot with chips, pickled beetroot, and red cabbage all served with crusty bread proving more than adequate for most. Children under the age of 16 years were admitted free, as long as they were with their parents of course! Each race on the eight race cards was sponsored by one of the lodges, chapters or other Masonic Order from the group, all for the princely sum of £10. The betting was tote style with the odds calculated on the sums bet on each race, returns varied between evens and 6/1. There wasn’t a single odds-on shot that won all night! Typical, you would have thought the event had been run by a bookie. In each race it was possible to “buy” the ownership of a horse and the owner’s prize for each race was a rather nice bottle of wine. The races were a whole heap of fun and the jockeys riding ‘their’ horses’ home would surely have been given three day bans for excessive use of the whip had they been riding at Haydock rather than Leigh, there were several chair legs with whip marks and as usual there wasn’t a steward in sight thank goodness. The finale was a special race where the ‘ownership’ of each runner was offered for sale by auction and the prices bid on a couple of the runners was over £20, quite remarkable when one considers that there was no form to go on. The race prize money of £50 was won by Sue, one of the chefs at Leigh and was promptly put straight into the Macmillan donation tin to rapturous applause. There was no Red Rum or Tiger Roll in attendance but everyone had a fantastic time and raised £903.10 all told. Steve Ralph the Leigh Group Charity Representative commented “It was a fantastic result”. MMmmm, did he have a winner or two? Article and photographs by Wayne Barnes.